Rabbits are even cuter in person ... full of whimsy! Will use for Easter decorations then use as a door stop. Piece is small but heavy. It has good detail. Recommend purchase. Kissing Rabbits Garden Sculpture - Parent Child Bunny Yard Decor - 12 in. x 4.5 in. x 14 in. Hop on top! Weighty enough to serve as a doorstop and more than adorable enough to attract attention along a garden path or pond, this bunch of bunnies statue is an heirloom quality, Design Toscano-exclusive animal sculpture. Our solid cast iron rabbit sculpture is hand-crafted in iron using the ancient sand cast method to capture each detail. 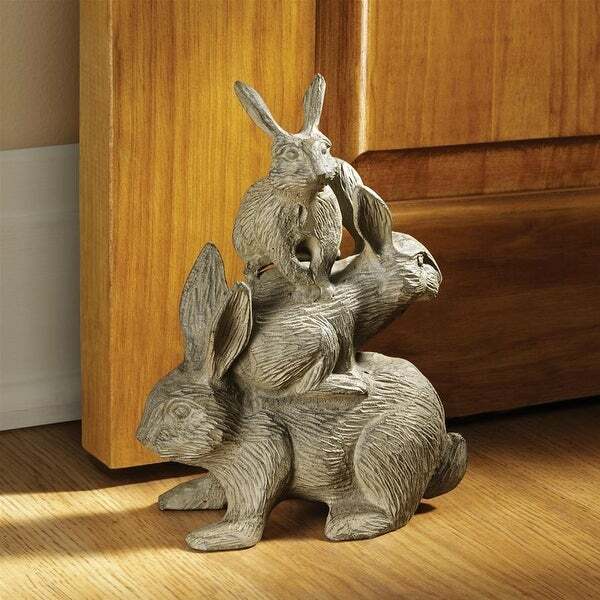 Our Rabbit statue has enough vintage charm to be passed along through the generations. A beautiful animal figurine for home or garden! 6"Wx3½"Dx8"H. 8 lbs. Set of 6 Country Rustic Springtime Bunny Rabbit Garden Statues 9"
Polystone Carved Lounging Bunny 17.5"L"